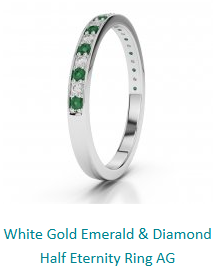 Eternity rings are the symbol of eternal love, passion and commitment. Whenever we think about the jewellery which can express our deep emotions towards our loved ones, I guess diamond rings are our obvious choice. Even in the engagements and weddings it holds a special place. Today there are a lot of jewellery trends and designs but not every piece of modern jewels can make that everlasting impression. Eternity rings, from the ancient times, hold a special place because of its unique design and appeal. The concept of eternity rings first came into existence when ancient Egyptians used them as the symbol of everlasting love. 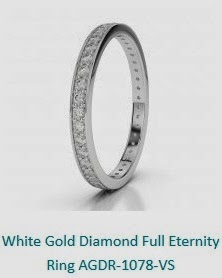 This beautiful white gold diamond full eternity ring is ideal to pair with diamond necklace. Featuring round brilliant cut diamond with channel setting, this ring will complement the beauty of your loved one perfectly. Rounded brilliant cut diamond is currently one of the hottest trends in market and couples prefer to buy it for their engagement. Well as the saying goes love is not bounded by occasions, this ring is the perfect token to show your love; a beautiful token which symbolizes everlasting love. Another beautiful piece of jewel from AG and Sons specially made to enhance the beauty of the bride. When teamed up with other rose gold bridal jewellery, this ring perfectly makes the beauty statement. 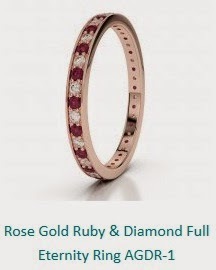 This beautiful ring also features round brilliant cut diamond with channel setting and comes in a beautiful packaging. This beautiful token of love expresses the meaning of “forever” perfectly.